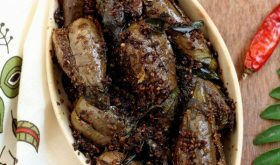 Though this recipe is time consuming in terms of preparation, its worth the effort and time. Makes for a satisfying, nutritious, and delicious one pot meal. And not to mention, its a great way to get Nehal to eat his vegetables. Be prepared for some good amount of chopping. I chopped and chopped and chopped! 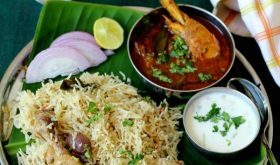 🙂 You’ll need to plan ahead by chopping the vegetables and pureeing the tomatoes, but believe me, it’s well worth the effort, and if you chop some extra quantity of vegetables you’ll be prepared for cooking another vegetable-laden meal. 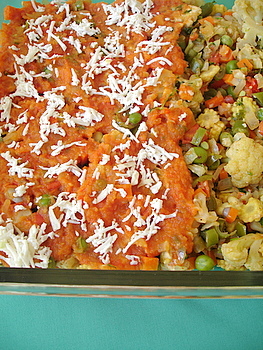 I had some chopped vegetables left after preparing the vegetable jalfrazi which I used for preparing Mexican rice. We had the jalfrazi with homemade bread while my son had it with sesame buns. Very simple to put together. 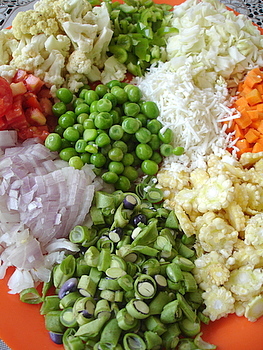 Chop mixed vegetables finely (carrots, baby corn, cabbage, green peas, onions, beans, cauliflower, tomato and capsicum). Heat 1 tbsp of olive oil in a heavy bottomed vessel, add onions and saute for 2 mts. Add rest of the vegetables and saute for 7-8 mts. Add kasuri methi (1 tsp), fresh coriander leaves (1 tbsp), salt and red chilli powder to taste. 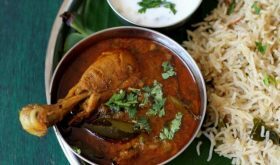 Garam masala powder is an optional ingredient and a large pinch can be added for those who like masala flavor. Combine well and keep aside. Blanch tomatoes for 3-4 mts, peel skin and puree. Heat a tbsp of olive oil in a vessel, add some crushed garlic (3-4 cloves) and one chopped onion and saute for 4 mts. Add four chopped tomatoes and cook for 10-12 mts. Add salt, large pinch red chilli powder and a teaspoon of jaggery. Turn off heat and cool. Once cool, blend to a fine paste. Keep aside the onion-tomato paste aside. Grate paneer (1/4 cup) and keep aside. If you want a cheesy flavor, use cheese in place of paneer. Take an oven proof square glass baking pan. 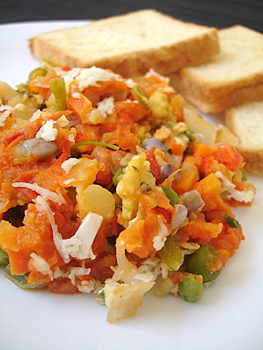 Spread a layer of the sauteed vegetables, then spread a layer of the onion-tomato paste over the vegetables. Finally sprinkle grated paneer or cheese all over. Bake in a pre-heated oven at 200 C for 10-12 mts. Serve with bread or buns. 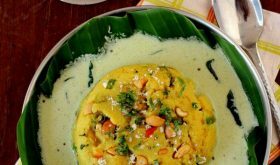 This recipe is my entry to the food blog event ‘The Saas, Bahu Aur Sensex Contest’ hosted by the lovely Nags of Edible Garden to celebrate the spirit and individuality of Indian women worldwide. I can imagine taking a slice of bread and eating that jalfrezi. jalfrazi looks mouthwatering. Must have tasted really good. Great Entry. Great and looks to be delicious. Tomorrow being a Holiday, I will try this without fail. Thank U Sailuji for the great effort. Pl keep it up. Regards, RP. Hyderabad. Wow, this jalfrezi looks excellent! My question is this: When I make paneer, it tastes delicious, but is never the right consistency to grate- it’s softer, almost like very firm cream cheese. Is there something I’m doing wrong? I let it strain for ages, but it’s still quite soft. In any even, I suppose I could just crumble it over the top instead of shredding. Lovely colors Sailu. As Jeni mentioned, I sometimes have the problem with home made paneer, no problem with the store bought ones. I have some sucess when I refridgerate the homemade paneer. great recipe for a beautiful event! That is load of veggie in one pot 🙂 Should be perfect meal with bread slice! What a lovely idea! I was instantly drawn to the word baking. Hi Sailu, As usual a beautiful treat for the eyes and for the mouth. I had a question though- what happens to the onion masala paste that you have mentioned? When does it get added to the dish? 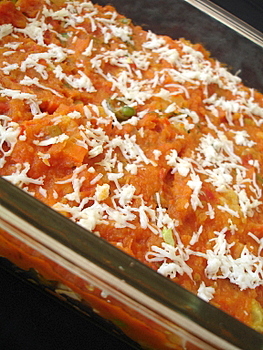 The tomato paste layer you see spread over the vegetables is the onion masala paste. I have updated the post by mentioning ‘onion tomato paste’ instead of ‘tomato puree’. I guess the phrase ‘tomato puree’ confused you. That looks pretty colorful and flavorful!!!! 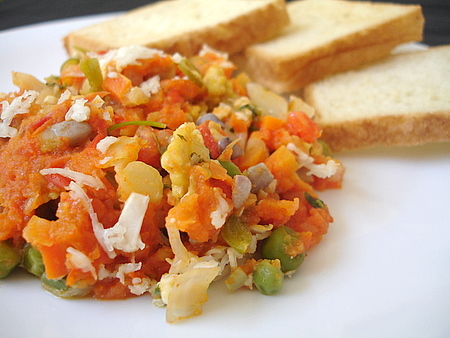 Looks similar to pav bhaji!colourful n tempting. It’s a feast to the eyes also Sailu. I’m going to try this for rotis. very nice Sailaja. Good one. thru baking extra oil use can be avoided. I liked this. it looks like a marriage hall kitchen. You are slowly promoting us towards safeside diet. All the best Sailu. Thank you. it seems yumm!! will try this one soon! I added some coconut milk to the onion tomato mix….just to get the sourness a tad down and add texture. 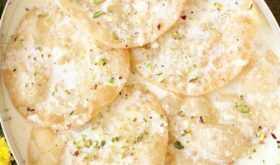 What cheese can i use if i am not using paneer? Grateful if you could let me know immediately because i am keen to make it today.